You can enhance your picture by adding effects, such as shadows, glows, reflections, soft edges, bevels, and three-dimensional (3-D) rotations to it. You can also add an artistic effect to a picture or change the brightness, contrast, or sharpness of a picture. Select the picture for which you want to add or change an effect. 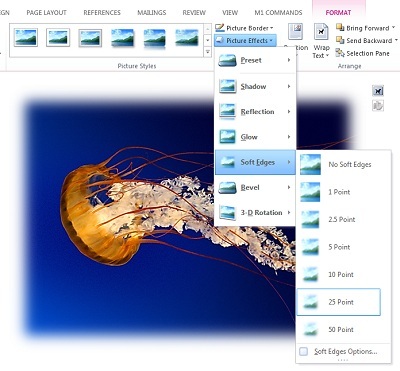 Under Picture Tools, on the Format tab, in the Picture Styles group, click Picture Effects. Rest your pointer on one of the Picture Effects options to see a menu of different ways to apply each effect. When you rest your pointer on one of the menu effects, the effect appears as a preview on the picture in your document. If you do not see the Picture Tools or Format tabs, double-click the picture to make sure that you selected it. If you see [Compatibility Mode] next to the file name at the top of the program window, try saving your document into a format such as *.docx or *.xlsx instead of an earlier file format such as *.doc or *.xls, and then try again. Each category of picture effect has a No <Effect Name> option at the top of its menu. Select that option to turn off an effect that you don't want. For example, to remove a shadow, point to Picture Effects > Shadow > No Shadow. Select the picture for which you remove an effect. Under Picture Tools, on the Format tab, in the Picture Styles group, select Picture Effects. Select the Picture Effects category that you want to remove. In the menu that appears, the first option is No <Effect Name> (such as No Shadow or No Reflection). Select that option to remove that kind of effect from the picture. Click the picture for which you want to add or change an effect. To customize the built-in effect, click 3-D Options, and then adjust the options that you want. To customize the shadow, click Shadow Options, and then adjust the options that you want. 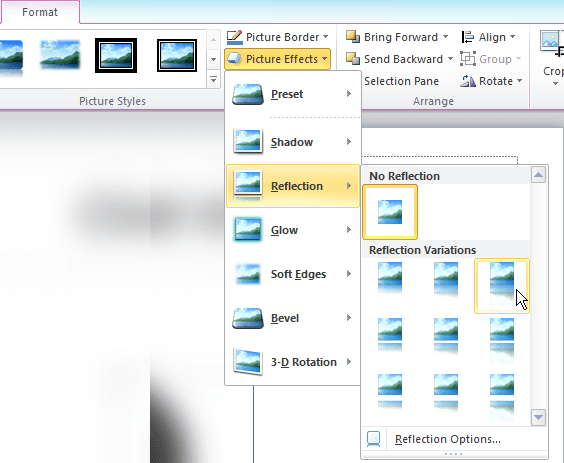 To customize the reflection, click Reflection Options, and then adjust the options that you want. To customize the glow variation, click Glow Options, and then adjust the options that you want. To add or change a soft edge, point to Soft Edges, and then click the size of the soft edge that you want. To customize the soft edges, click Soft Edges Options, and then adjust the options that you want. To customize the bevel, click 3-D Options, and then adjust the options that you want. To customize the rotation, click 3-D Rotation Options, and then adjust the options that you want. For additional information about the options in these panes, click Help at the top of the Format Picture dialog box. If you do not see the Picture Tools or Format tabs, double-click the picture to make sure that you selected it. If you see [Compatibility Mode] next to the file name at the top of the Office Excel 2007 window, try saving your document as an 2007 Microsoft Office system document instead of an Office 2003 document, and then try again. To customize the built-in effect, click 3-D Options, and then choose the options that you want. For additional information about the options in the 3-D Format pane, click Help at the top of the Format Picture dialog box. 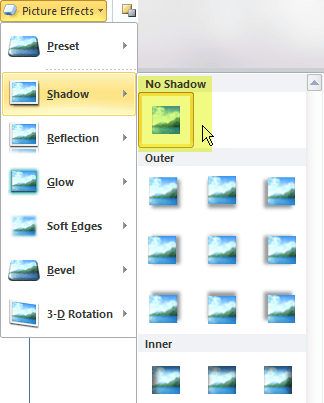 To customize the shadow, click Shadow Options, and then choose the options that you want. 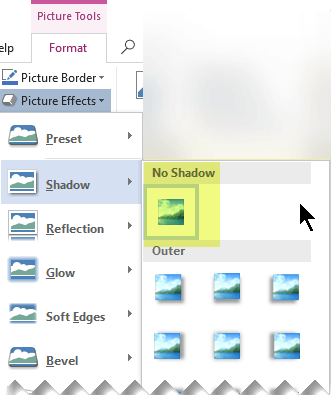 For additional information about the options in the Shadow pane, click Help at the top of the Format Picture dialog box. To customize the glow colors, click More Glow Colors, and then choose the color that you want. To change to a color that is not in the theme colors, click More Colors, and then either click the color that you want on the Standard tab, or mix your own color on the Custom tab. Custom colors and colors on the Standard tab do not update if you later change the document theme. For more information about themes, see All about themes, Quick Styles, cell styles, and background styles. To customize the bevel, click 3-D Options, and then choose the options that you want. For additional information about the options in the 3-D Format pane, click Help at the top of the Format Picture dialog box. To customize the rotation, click 3-D Rotation Options, and then choose the options that you want. For additional information about the options in the 3-D Rotation pane, click Help at the top of the Format Shape dialog box. To remove an effect that you've added to the picture, point to the menu entry for the effect, and then click the option to remove the effect. For example, to remove a shadow, point to Shadow, and then click No Shadow.